I found this amazing recipe on Half Baked, for Rugelach. 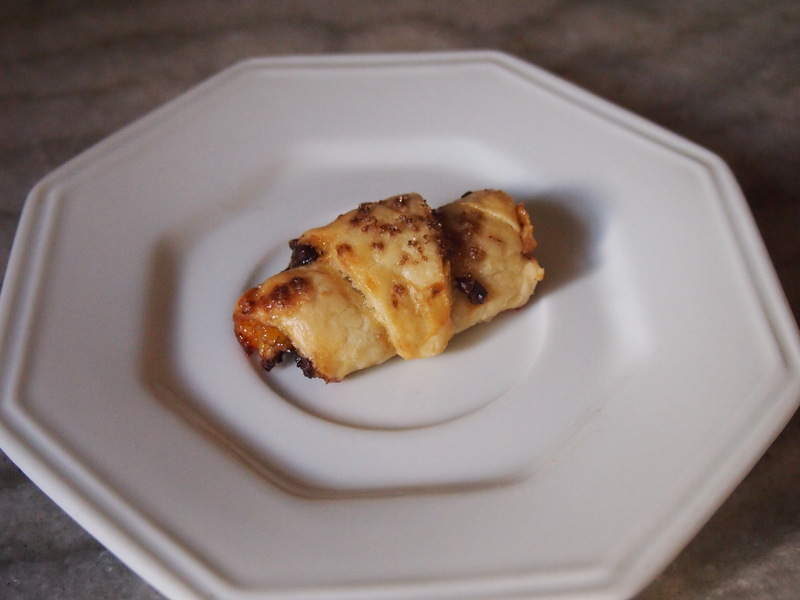 It looked fantastic – like a flaky pastry filled with goodness, and although I’d never tasted rugelach before and really knew nothing about it, I set out to replicate it. It turns out it was fairly simple to make and absolutely delicious. It was perfect for Sunday mate dates with park views from the balcony. This is becoming a Sunday ritual. 1/2 a Cup of Jam, Heated to Liquify. I used Peach. Make the dough first. Leave the butter and cream cheese to soften on the counter for a bit, and then mix together with the flour and the salt. If you have a food processor, now would be the time to use it. I used my hands, it was fun. When the dough is thoroughly mixed, divide into two balls, cover in saran wrap and chill in the refrigerator for an hour or longer. While the dough is chilling, chop the walnuts and chocolate and put the jam in the microwave for a few seconds to liquify it. On a piece of wax paper, generously sprinkled with flour, roll out the dough into a 10-12 inch circle. Spoon the jam and spread thinly and evenly, and then sprinkle with the nuts and chocolate. Slice like a pizza and starting at the wide end of the slice, roll up. Refrigerate the cookies for half an hour until the become firm and preheat the oven to 350 degrees. Beat the egg with water and then lightly coat the tops of the cookies. Sprinkle with sugar. Bake for 30 minutes until they are lightly browned. Enjoy! OMG yuuuuuuum! Did you get a new camera lens? When did you say you were coming home? One more suggestion for both Rugelach and Cinnamon rolls, substitute raisins for chocolate chips! I am going to have to try these little treats. I think I would add dates instead of raisins. Thanks for taking the time in sharing the recipe. mmm dates would work amazingly well! Let me know how they turn out! I am from New York and a member of the tribe , so I know me a good rugelach when I see one- and those look perfect!! I need to make these , thanks for the recipe! I just remade the recipe, and i can confirm – it’s a winner.